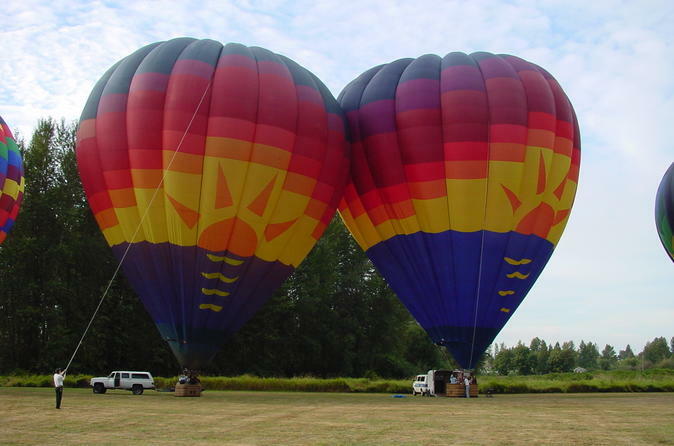 Float above the Majestic Snohomish Valley in this 3 hour hot air balloon tour! Share this experience with friends and family! Take off from Harvey Airfield and float above the Kenwanda golf course. Fly over treetops and dive behind trees at the river's edge! These flights include a catered snack tray arrangement along with the toast and celebration, and usually turns into a fine party with your new friends.They also often go though the best scenery the Snohomish Valley has to offer. “Our favorite flight path in Snohomish is our normal area of operations. The flight involves taking off from Harvey airfield, climbing high to catch winds going south until we near the Kenwanda golf course. Then we drop, accounting for wind between our altitude and the surface, so that we end up low over the golf course, and get carried east by the surface wind which lets us slide over the ridge down into the river valley. We use the way the ground affects the surface winds to navigate where we want to go. We have two beautiful balloons in our fleet. They differ in basket size. The small basket (balloon is 140,000 cubic feet, basket is 4′ x 6′) is perfect for 4-6 passengers and the larger basket (balloon is 210,000 cu ft and the basket is almost 6′ x 8′) is ideal for 8 to 10 passengers. On any given day, depending on bookings, we may fly one or two balloons. Or you can book a certain size balloon for your special group.